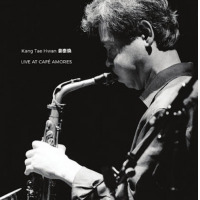 South Korean reedman Kang Tae Hwan is one of the foremost exponents of solo saxophone in the Far East. While he has featured in groups, notably Ton Klami who can be heard on Prophecy Of Nue (NoBusiness, 2017), his conception is so singular that it may be best appreciated in undiluted form. Which makes Live At Cafe Amores a prime exhibit to further awareness of his extraordinary art. It's another in the Lithuanian label's ongoing series of unreleased Chap Chap label recordings licensed from Japan. His combination of multiphonics, overtones and sustained circular breathing recalls some of AACM reedman Roscoe Mitchell's solo outings, while he also sometimes suggests a more serene Evan Parker. Kang thrills with astonishingly controlled use of overblowing to reveal the vibrating harmonics of his alto saxophone. What's all the more impressive is that it sounds completely purposeful but is achieved almost naturally without any ostentation. "Solo I" presents the perfect example of the rarefied atmosphere on offer. Kang sets out a sequence of deliberately-paced prolonged notes remarkable for their consistency and purity, spiced with split tones, in a meditative stream. He occasionally dips into a broad vibrato by way of variation, then later introduces a spiraling equivalent to a double time passage amid the continued drawn-out notes. Pentatonic melodies create an Eastern vibe, and sometimes as in "Solo II" even evoke Scottish folk music, a feeling exacerbated by use of a skirling bagpipes-like pitch. Although Kang works with the same building blocks throughout, he succeeds in giving each of the five pieces a distinct flavor, no mean feat when working with such a self-imposed restricted palette, as many other improvisers have discovered to their cost. In "Solo III" he intersperses intermittent short dancing phrases and rhythmically-inflected oscillating frequencies, while in "Solo IV" he juxtaposes flutter-tongued wickering with the elongated tones. At over 68-minutes it's an hypnotic if somewhat intense listen, so perhaps the most appropriate strategy is to sample one track at a time when in the mood to admire Kang's unrivalled mastery. Track Listing: Solo I; Solo II; Solo III; Solo IV; Solo V.
Personnel: Kang Tae Hwan: alto saxophone.